A new home anchors Kennebunk’s Gooch’s Beach while referencing the past and anticipating the future. Since 1660, there has been an inn on one end of Gooch’s Beach in Kennebunk. Since 1756, that establishment has been the Seaside Inn, run by the Gooch family and their descendants. In fact, the current owners are ninth-generation innkeepers, which makes the Seaside Inn the oldest continuously operating family business in the country. In 1959, a ranch house called The Dunes was built next to the inn and by 2001—when a Wisconsin bond manager, his wife, and two children were visiting the Kennebunks—the house was available for rental. The family rented each August till 2009, when the Seaside Inn’s 20 acres were subdivided, and the house came up for sale. “We love that beach. We love that community,” the husband says. “We had to buy it or say goodbye.” The property was spectacular, directly abutting the beach and with broad views up and down the coastline, but the ranch was in disrepair. The family wanted to build new, but they had to act fast, as FEMA was changing the flood maps. If they waited, they wouldn’t be able to build. Now, two years after completion, the house is a blue shingle-style cottage with interesting rooflines, variable window patterns, an eyebrow dormer, porthole windows, a widow’s walk, an octagonal turret, master bedroom balcony, and stately chimney. On arrival, one pulls into a drive made of pavers fashioned to look like cobblestones and parks in front of a small blue building with an elaborate roof. It is, in fact, a shed, but it functions like “a folly,” which, Ted Carter of Ted Carter Inspired Landscapes in Buxton explains, is an ornamental structure that serves as “a place for the eye to rest.” Visual enticement though it may be, it’s hard to draw attention away from the main drama of the three-story house. The steps that lead up to the curving porch and through the front door are Mystic Mountain granite quarried in Maine. Instead of being the static salt and pepper of traditional granite, Mystic Mountain “has movement and life. It looks like the ocean has washed over the surface,” says Carter. As such, the stone serves as a good clue to what awaits beyond the front door: a nautically themed house that references the sea and the ships that sail on it. The kitchen resembles a yacht with arching windows on the prow. A teak and holly breakfast table with banquette suggests an upscale galley, while upstairs there is a bunkroom with built-in beds and desk. A cherry ship ladder with stainless steel rails leads from the third floor to the widow’s walk. The home’s builder—Kevin Lord of Thomas and Lord in Kennebunkport—also built an impressive third floor turret room, which drew inspiration from a sea captain’s home. Its ceiling is finished with cherry bead board and cherry beams. The second and third floor bedrooms have built-in platform beds with bead board headboards and storage drawers underneath, as well as built-in dressers and shelves. Other nautical details include porthole windows, nautical lights at the base of the stair treads, a lighthouse- shaped newel post on the switchback staircase, and door hardware that has nautical rope detailing. Interior designers Nicki Bongiorno of Spaces Kennebunkport and Louise Hurlbutt of Hurlbutt Designs in Kennebunk each played with the nautical theme as well. Bongiorno focused on a looser interpretation of the theme for interior finishes, paints, and material choices, while Hurlbutt went with a more traditional interpretation for furniture and accouterments. Hurlbutt opted for upholstery in a range of blues accented with pillows patterned with seahorses, fish, and starfish. She also procured items like a game table and a rope chandelier for over the kitchen table. Although the house is elegant—with a coffered ceiling and white subway tiles in the kitchen, hickory flooring, and detailed millwork–Hurlbutt and others were always aware that the house is intended for summer fun. Given this, the kitchen banquette has a blue, tan, and white striped cushion of Sunbrella fabric that Hurlbutt vinylized so people could sit on it in wet bathing suites. In the bathrooms, designer Nicki Bongiorno let the colors of the ocean direct the palette, while she opted for less literal forms. She picked glass tiles that reminded her of sea glass for one sea-foam-colored bathroom. For another bathroom she found glass tiles that reminded her of the interior of mussel shells. For the laundry room—itself impressively engineered to include a drying rack with a metal trough for wetsuits—Bongiorno found tiles with an interlocking pattern that suggests ocean waves. Other aspects of the house reference not the sea per se, but the area. The homeowner liked the stone used at the Franciscan monastery just down the road, so a similar stone is used for his chimney, which was built by the late Ray Dussault of Biddeford and his crew. For a different building project in the neighborhood, Kevin Lord razed an old post and beam house. Beams from that house now form two fireplace mantles (one in the living room and one in the octagonal turret’s screen porch). Steve Doe of Whitten Hill Studio in Kennebunkport used wood from the same house to make a dining room table. One of the surprises of the house is that even though it sits on the road, next to the Seaside Inn, and by the beach, it feels private. The sight lines are such that you can sit in the living room and look right out on the ocean and not see the activity on the sand below. Landscape architect Ted Carter created a barrier of maples, flowering hawthorn, and Austrian pine between the home and the hotel, and one of flowering hawthorn between the home and the street. He also created a mini-beach setting on the property with sand and grasses that surround a wood-burning fire pit that is fueled through a gas feed from the house. After Carter allocated a certain amount of the property to the dune system as required by the Department of Environmental Protection, he picked plants that could thrive despite the dehydration and windburn that occurs on beachfront property. In addition to the maple and flowering hawthorn, he planted Rosa virginiana, tall ornamental grasses, and mugo pine. Where there had once been a chain-link fence, there is now a split post and rail western cedar fence surrounded by Rosa virginiana and bayberry. M. Welch and Sons of Arundel excavated the site and worked hand-in-hand with Ted Carter on all aspects of the landscaping. It was what he felt he had to do, because he was building not just a house but a heirloom. The choice to use geothermal heating and air conditioning instead of fossil fuels reflects the same desire. The homeowner wanted his children, his children’s children, and beyond to enjoy the house. 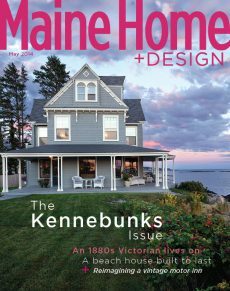 The house looks back and forward, anchored in the traditions of the Kennebunk coastline cottages where he built (as well as those of his immediate neighbors) while creating a property that aims to stay in the family for generations to come.